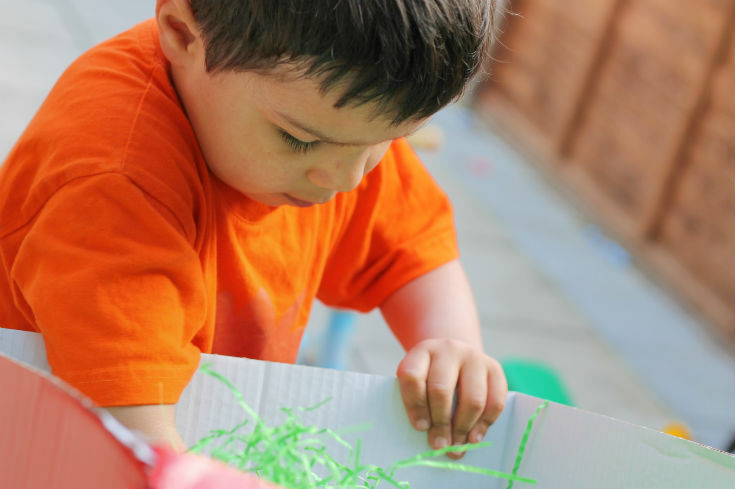 The boys love the ideas of Easter Egg Hunts but since we can’t do a chocolate Easter Egg hunt every day, I came up with another idea for them: a fine motor Easter egg hunt! This is a really simple idea which took me under 5 minutes to set up. 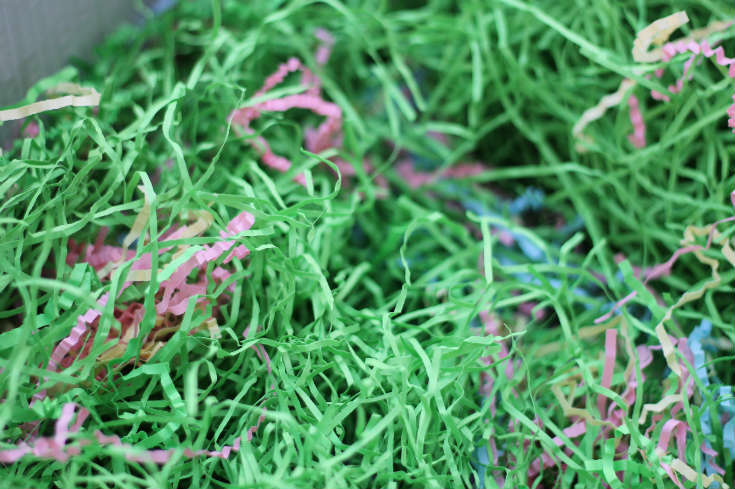 A bag of Easter grass which I mixed with some extra green shredded paper I had from a parcel packaging. You could use any shredded green paper or even try shredded tissue paper. Easter Sprinkles – There are several varieties available from Baker Ross but we used the Easter Egg shape to stay true to the Easter egg hunt idea! 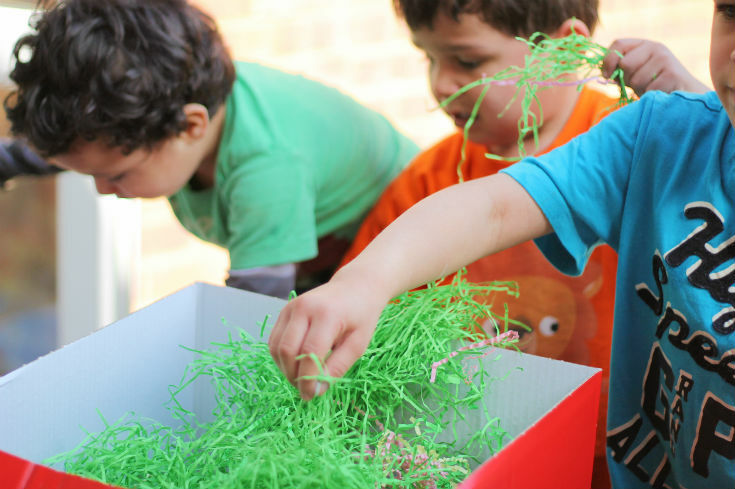 I used a large parcel box to place all the shredded “grass” and the Easter egg sprinkles and mixed them all up. 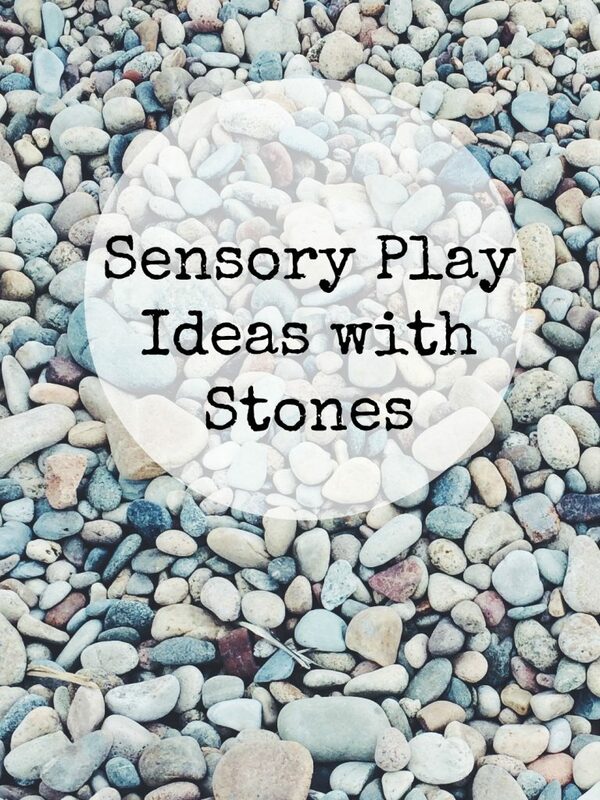 For any of you who have been reading my blog since the very early days and remember how we used to do all the sensory activities in the baby bath, that bath is now broken so I’m looking for a suitable replacement! Although the tough spot (cement mixing tray) is great for a lot of things, it doesn’t have that much depth. A large washing up bowl would probably work well, but as this activity is totally dry the parcel box was okay. 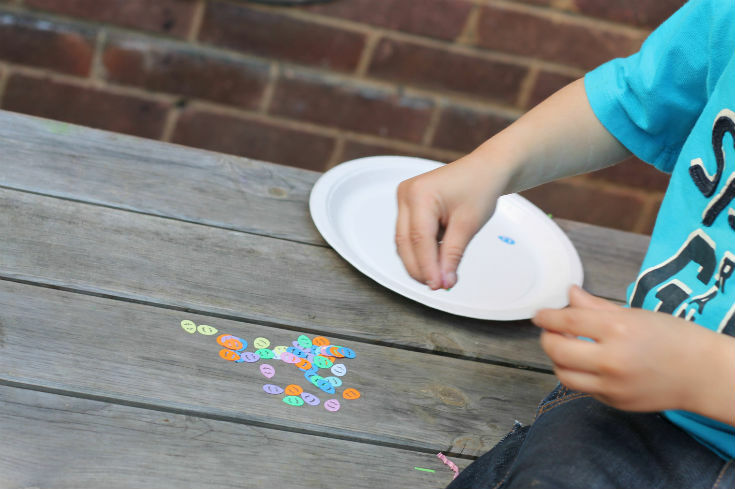 The boys worked on hunting through the grass to find as many of the tiny Easter eggs as they could then carefully picking them up and placing them onto their own paper plate. Mr Z wanted to make it a competition so they had a separate plate each and they counted them at the end to see who had found the most. 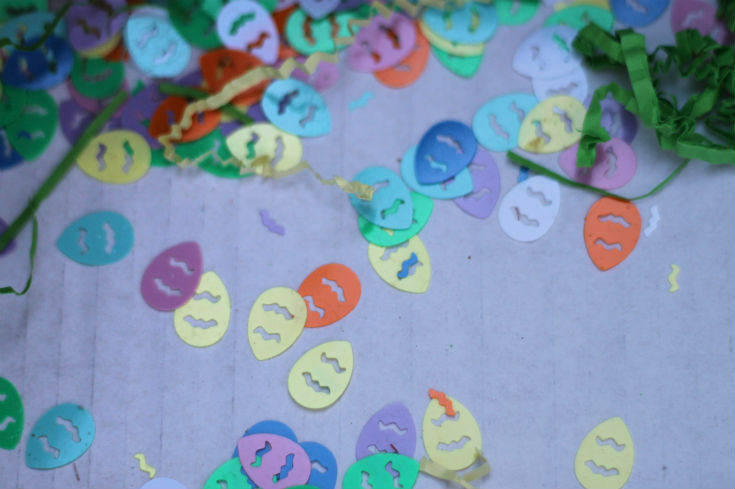 Because the Easter Egg Sprinkles are so small they had to use a pincer grip to pick them all up. Once they are all found there are plenty of opportunities for counting, sorting, colour matching and making patterns. 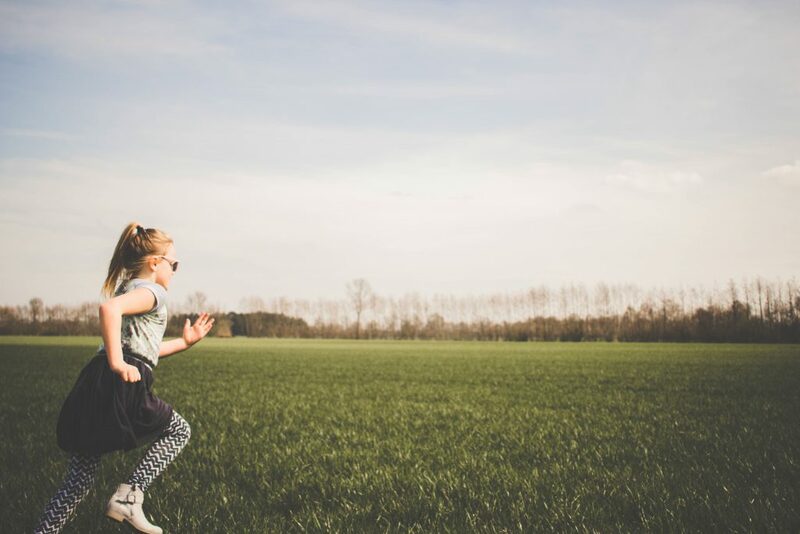 We have done a chocolate Easter egg hunt too, so look out for that post soon if you are looking for more Easter egg hunt ideas or quiz questions for an Easter egg trail. Have you tried any alternative Easter egg hunt ideas? Let me know in the comments! This looks like a really fun idea. Will have to do something like this for my two! We did this exact same thing earlier this week with mini eggs in Shreaded paper – it was great fun. I absolutely love this idea! I have the same supplies so I am going to do this for sure. I’ve pinned so I don’t forget! Such a great idea. My daughter is too young so I have pinned this for next year. What a fun idea – we might have to try this out at our house! What a fun activity!! My daughter loves egg hunts. She has actually hid some needle felted eggs for the Easter Bunny to find while he is hiding her eggs. Thank you for sharing at Sharing Saturday! Great post I’m going to feature tomorrow on the parenting pin it party.